Lemon and Coconut Cream Pie... in a Jar! Guys, I believe I'm what's known as an "over-committer" — you know, the kind of person who signs up for too many things and spreads herself way too thin? Let's take the end of April as an example. What a crazy week that was! In less than seven days, in addition to my full time job at a crazy-busy start-up, I had gone to New York and back, competed in a trail race that I was way undertrained for, met with both my realtor and mortgage officer for the first time, attended a Portland food blogger's event by the Little Green Pickle, and committed to baking three items for the National Food Bloggers' Bake Sale. Yikes, just writing all that stuff out gave me a headache. 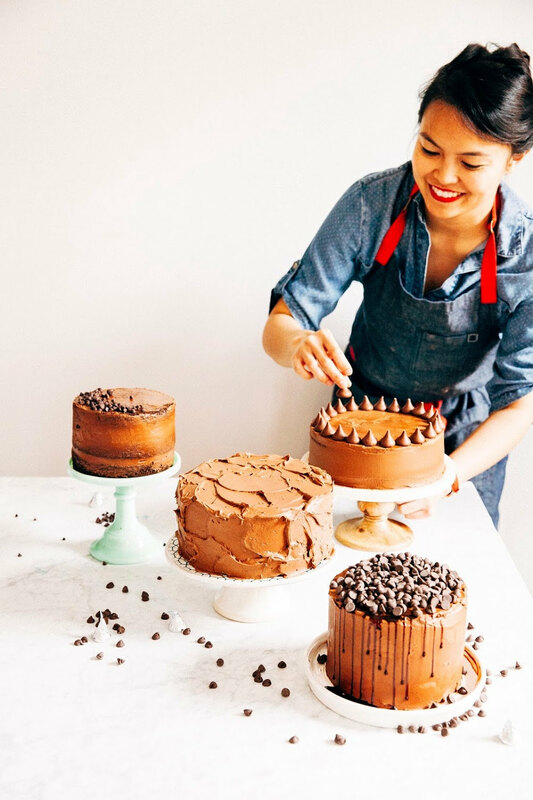 So on the Friday of that week, I had a slight panic attack when I realized that it was the National Food Bloggers' Bake Sale the next morning and I hadn't even started on any of the baked goods I promised to bring. Heck, I didn't even have any ingredients ready. To be fair, it was my fault entirely — the wonderful Fabiola of Not Just Baked had organized the Oregon chapter, and she'd done a great job of nudging us bloggers along with many gentle reminders. It was just my own inept planning that had landed me in this somewhat-screwed position in the first place. Because seriously, which idiot goes out of state, competes in a brutally steep and body-wrecking 6-mile trail run, and promises to make chocolate truffles, homemade oreos, and lemon tartelettes all in 5 days? This idiot, apparently. And looking at the ambitious list of goods I had promised for the bake sale, I just had to laugh at myself. The truffles could stay, but the homemade oreos had to go. Sandwich cookies (like these brownie variation), while tasty, fun, and beautiful, had a low yield and were time consuming to make. And lemon pie tartelettes? Who was I kidding? How on earth was I supposed to transport 24 miniature pies by bicycle, my primary mode of transportation? Pie. In a jar. Because what's more durable than a mason jar?! 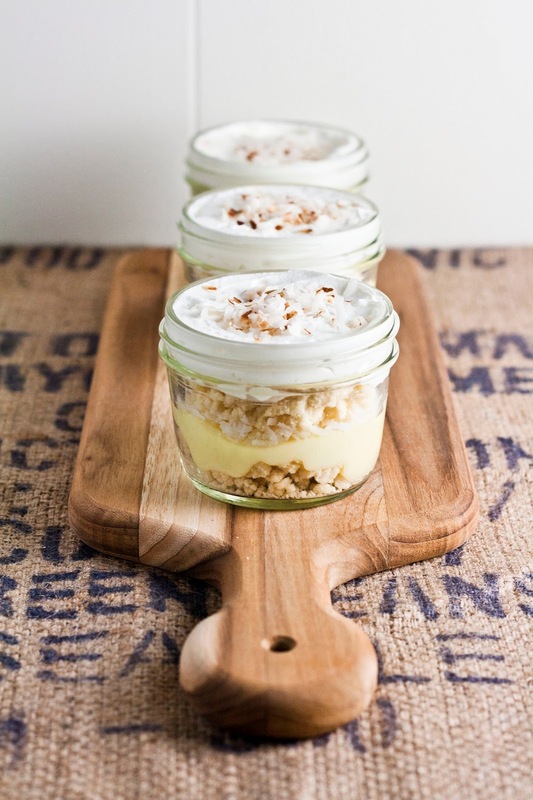 My boyfriend had been bugging me to make a parfait for some time now, and needless to say his nagging paid off since it turned out that parfaits ended up being my main source of inspiration for this recipe. If I was going to stuff tartelettes in a jar and sell them to the public, they better be pretty right? I couldn't just shove them in there. And what's prettier than a parfait with its layers of cream? Figuring out how to stuff tart crust into a jar turned into another challenge of sorts. I decided to take my regular pie crust recipe and simply crumbled it together instead of delicately rolling it into a pie crust. It ended up working wonderfully — the same flavor, minus the fuss that usually comes with baking a pie crust. Buttery and delicious, especially when layered between lemon cream, toasted coconut, and vanilla chantilly cream. The bake sale itself ended up being a massive success. All the proceeds from the bake sale were donated to No Kid Hungry, a charity dedicated to ending childhood hunger in America by helping provide kids access to nutritional food and educating low-income families how to cook healthy, affordable meals. Together with other bloggers, we made over $800 total! Special thanks to Fabi and all the other wonderful bloggers who participated for making such a wonderful event come to life in Portland. 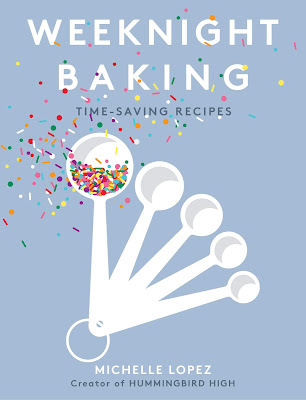 Combine 1 1/2 cups flour, 2 tablespoons sugar, and 3/4 salt in the bowl of a freestanding electric mixer fitted with a paddle attachment and mix on low speed until combined. In a small bowl or a liquid measuring cup, whisk together 8 tablespoons melted unsalted butter and 1 1/2 tablespoons water. With the mixer set on its lowest speed, slowly drizzle into the flour/sugar/salt mixture (from the first step) and continue mixing on low speed until the mixture starts to come together in small clusters. Spread the clusters on a parchment- or Silpat-lined sheet pan. Bake for 25 minutes or until the crumbs are golden brown and slightly moist to the touch; don't worry, the clusters will dry and harden as they cool. Let the crumbs cool on their sheet pan for 10 minutes, before using a dough scraper to break them up into small clusters. Place the sheet pan on a wire cooling rack and allow to cool completely before using in the recipe. In a small frying pan, toast 2 cups sweetened coconut flakes until golden-brown. Be careful not to overtoast since they tend to continue browning rather quickly. Set aside on a wire cooling rack and allow to cool completely before using in the recipe. Pour water to a depth of about 2 inches into deep saucepan, place over medium heat, and bring to a simmer. Combine 1/2 cup plus 2 tablespoons lemon juice, 3 large eggs plus 1 egg yolk, 3/4 cup sugar, and a pinch of salt in a heatproof bowl that will rest securely in the rim of a saucepan over and not touching the water. Whisk until the mixture becomes very thick and registers 180 (F) on a thermometer (this will take around 10 to 12 minutes). If you don't have a thermometer, don't worry -- the mixture should thicken to the point that your whisk leaves a trail through the curd. Just be sure to never let the egg yolks and sugar sit together for more than a moment without stirring; the sugar will cook the yolks and turn them granular. Don't let that happen. Remove the bowl from over the water and let cool to 140 (F), stirring from time to time to release the heat. While the mixture is cooling, cut 1 cup cold unsalted butter into 1-tablespoon sized pieces. When the cream is cooled, turn on your immersion blender (or transfer into your countertop blender) and add the butter 1 tablespoon at a time, blending well after each addition and making sure it is fully incorporated into the mixture before adding the next piece. This will take longer than you think it will, and the cream will start to turn into a pale yellow with a thick, opaque texture. Once all the butters have been fully incorporated, the cream is ready. Shortly before serving, combine cream and 2 tablespoons sugar in the bowl of an electric mixer fitted with a whisk attachment. Whisk on medium speed until soft peaks form, about 2 to 3 minutes. Start with pie crumbs and scoop a layer (I used about a tablespoon and a half) of pie crumbs at the bottom of each jar. Sprinkle a layer of toasted coconut flakes over the pie crumbs. Then, scoop a layer of lemon cream over the coconut flakes (I used about 2 tablespoons). 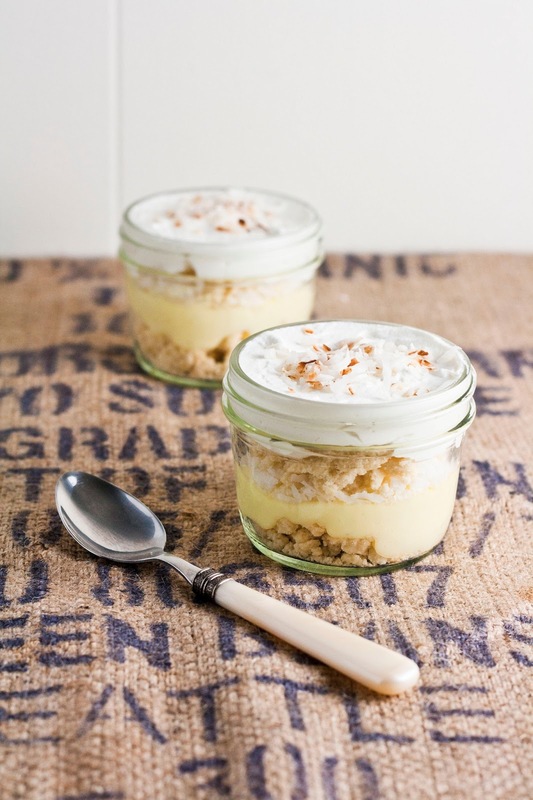 Sprinkle another layer of toasted coconut flakes over the lemon cream. 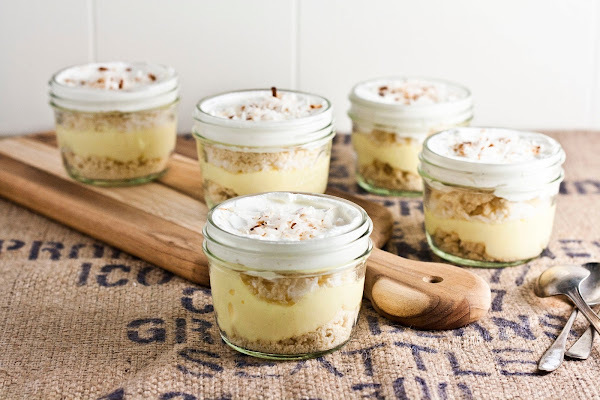 Finish by scooping a layer of vanilla chantilly cream (I used about 2 tablespoons) over the toasted coconut flakes, and finish with a garnish of coconut flakes. Voila! 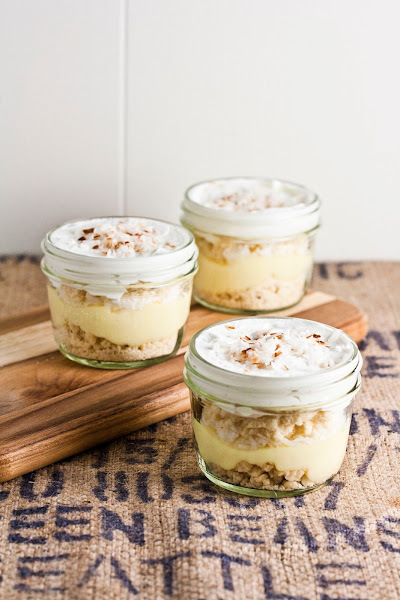 Lemon and coconut cream pie...in a jar. Gorgeous as usual! I totally hear you on the overcommitment, but even when I do less than this, I still feel stressed. I think I need the summer to spend a huge amount of time regrouping! I totally chuckled a little bit imagining you riding your bike with all those treats teetering off balance. :) Not that it's even remotely possible but it's still a silly thought.